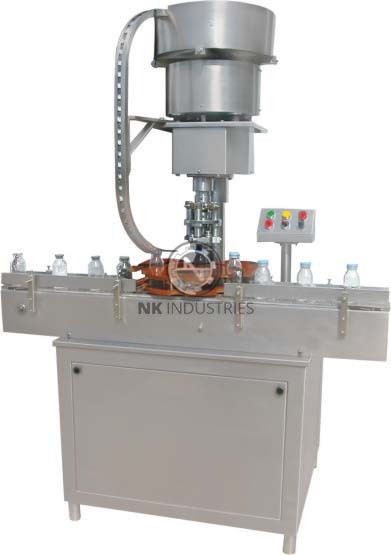 The Automatic Single head Vial Capping Machine / Vial Cap sealing Machine Model NKCS-60 is dedicated to the capping of vials for injectable products which is very critical part of the production process, since they guarantee hermetic seal & hence integrity of the drug inside the container. Automatic Single head Vial Capping machine is N.K Industries’s Solution to pharmaceutical industries where they can get moderate production output up to 50 Vial per minute. Automatic Single head Vial Capping Machine is sporadic motion machine for application & sealing of conventional flip-off caps & tear-off cap on Vial and Glass bottles. The Unique features of machine is “No Vial - No Capping” system. The CGMP Models are meticulously designed and offer a lowest particle generation during capping process. These Models are suitable for installation in conventional type contamination-controlled environments & under isolator. Due To Very Elegant Design It Results In User Friendly Operation & Minimum Maintenance. Parts Coming In Contact With The Vial, Aluminum Cap Are Made Out Of AISI 304. Crease Free Sealing & Qualitative Hermetic Sealing. Sealing Pressure Can Be Varied According To Diverse Sizes Of Flip Off Caps & Tear Off Caps. An Extraordinary Safety Clutch Device Is Incorporated On Star Wheel System For Stoppage Of Machine In The Event Via Gets Overturned Or In Any Jamming. Lowest Particle Generation. As An Option, Specially Designed Viton Sealing Roller & Pneumatic Sealing Head Available. All Electronics, Gear Motor And Gear Box Are Of CE Certified. “No Cap – No Vial” System. Automatic Sealing Head Up And Down System. Pneumatic Sealing Head And Viton Sealing Roller. Vision System For Cap And Seal Checking.